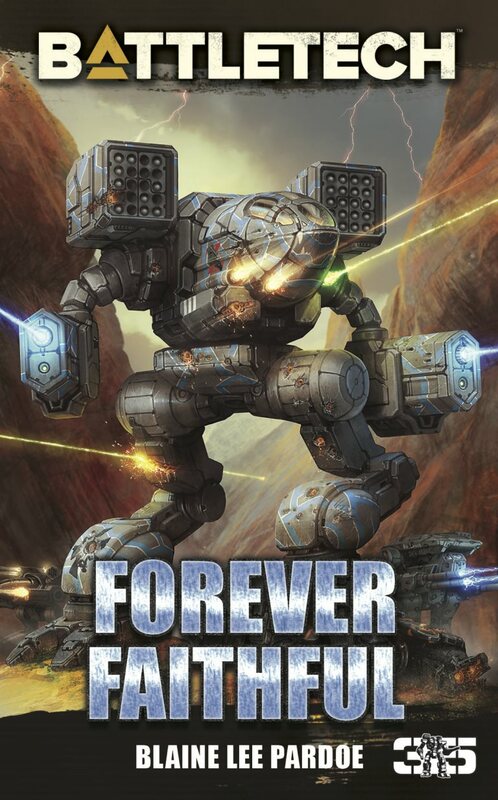 As the Inner Sphere enters the wars of 3067, you have the opportunity to take a unit into battle on the front lines. 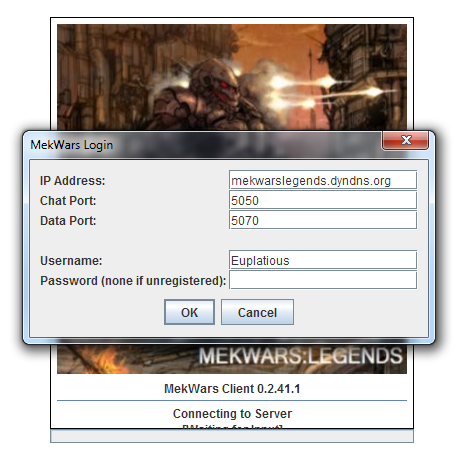 MekWars: Legends is one of several campaign servers that are publicly available to play on. In order to get an authentic experience, we created an account and took screenshots to show how the campaign works. If you have been wanting to try out either MegaMek generally or a MekWars server specifically, this is the chance to see what it is like from the ground level. MekWars: Legends has a beautifully done webpage. 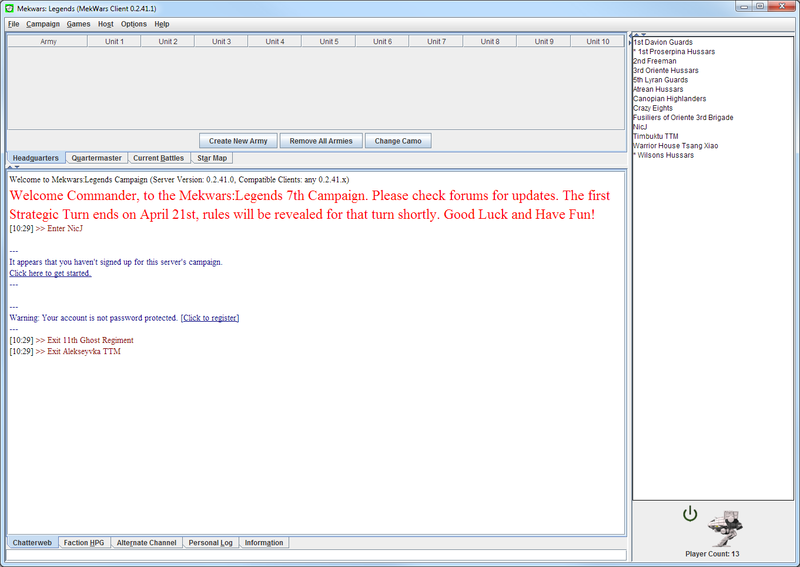 You can download the software for the MekWars/MegaMek client there, all in one. When you first load it up, you are looking at the log in screen. Logging in as my nick, Euplatious. Skip the password if this is your first log in. Once you have logged into the client, the typical MekWars screen appears. Most MekWars servers bring you into one beginner’s faction; for Legends, that is Boot Camp! Many servers require you to spend some time in the first faction before you can defect to another one, like the Word of Blake or Free Rasalhague Republic. Legends is different. 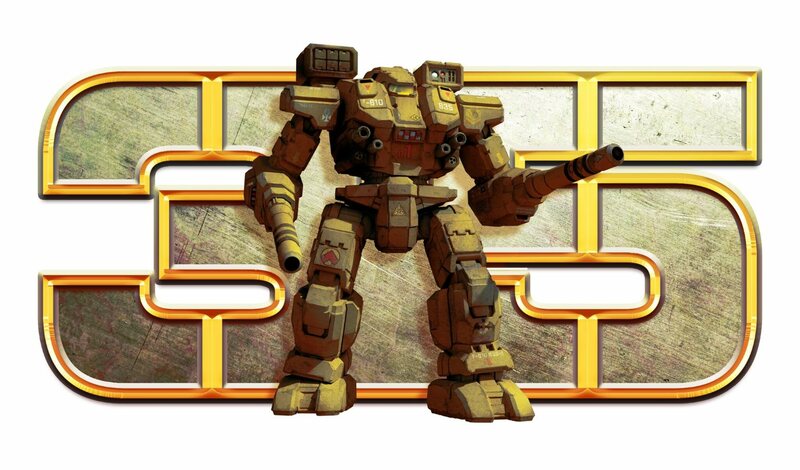 They assume that you have enough BattleTech experience already, and allow you to defect immediately upon joining. I’ve always had an affection for House Liao. For this walkthrough, I decide to defect to Liao. But, when I arrive, I find no units awaiting me (normally when you defect you get units from your new faction in your hangar). Within one minute of defecting, one of the mods messages me. Apparently, you need to select an in universe military unit in my faction which no one else has. (They recommend using the Sarna wiki to find out what units exist). Then you must log on with that unit’s name. If it does not work, then that name has been taken, and you need to choose another unit. Since this was experimental, I chose a lesser known secondary unit, the St. Ives Armored Cavalry. I created that nick, and then I was required to choose a focus. Your focus represents what specializations you have as a unit in the game. 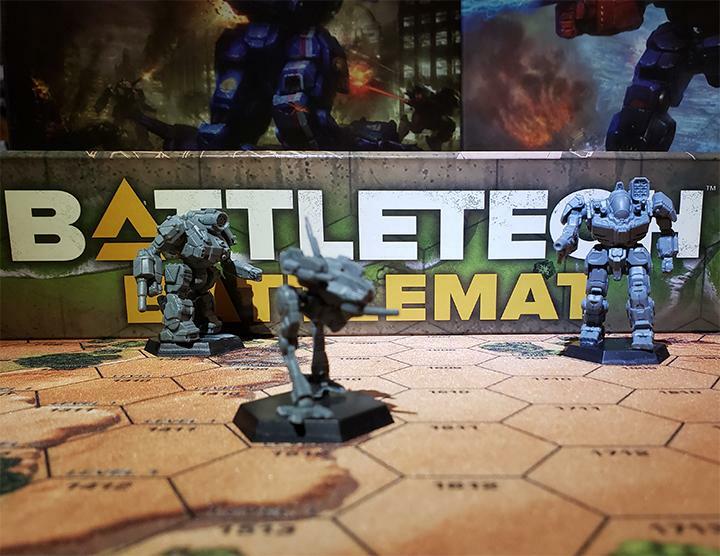 There are different focuses for different play styles, including Fire Support, Combined Arms, Storm formations and more. Just to make things interesting, I selected Combined Arms. Then I was moved to the Combined Arms subfaction of House Liao, and I could begin to add units. When you join Legends, you have a huge amount of bays for storing units as well as a ton of money to spend on purchasing units. 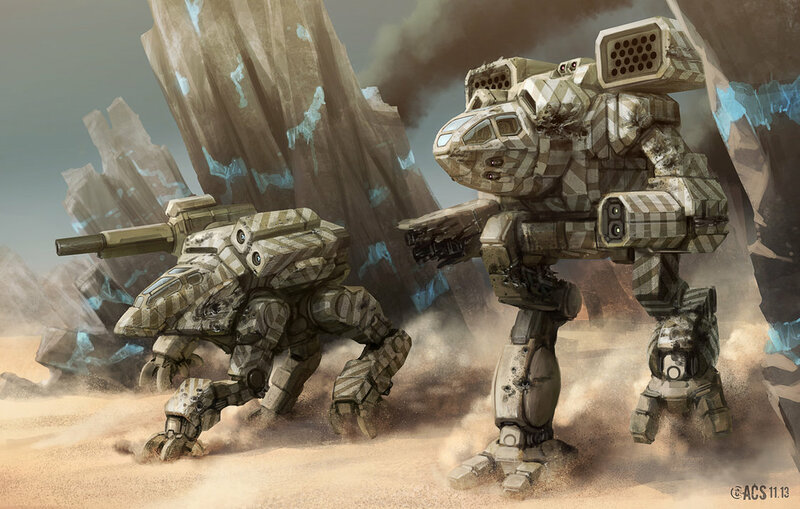 You tell the software that you want a certain type of unit, such as a light ‘Mech. It produces that unit at random from a factory in your territory. 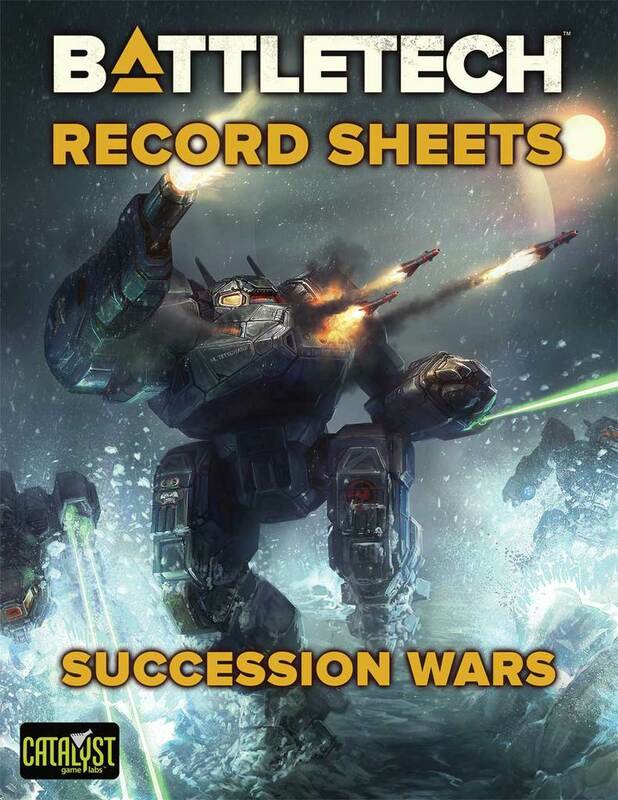 There is a build table for each subfaction that is used to randomly determine units. After a few minutes, I had built up quite a large amount of forces, but I still had money and bay space for a lot more. You are required to purchase every pilot for your units. 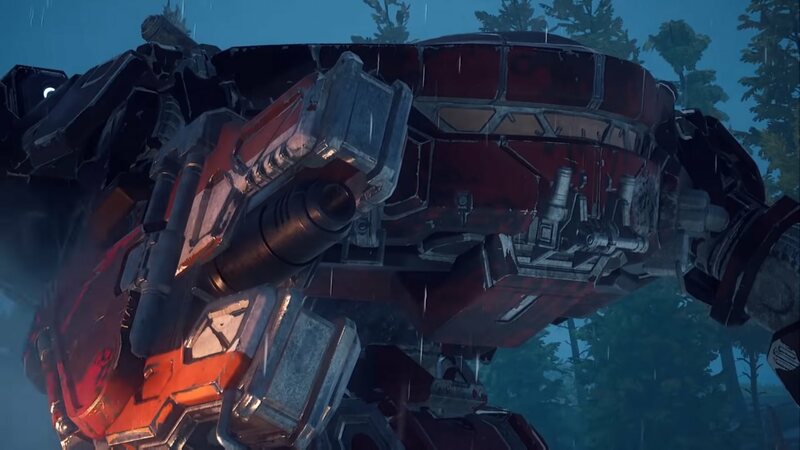 While that is time consuming, it gives you great flexibility, as you can move a light ‘Mech pilot to any other light ‘Mech and use your best pilots or level up others. 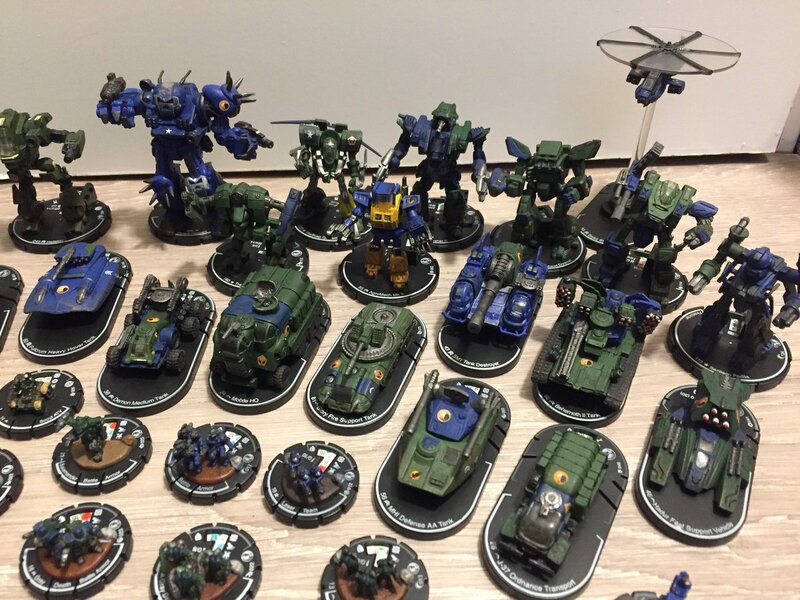 After creating my first army, you can begin to play others. You can create armies, and then take those active to the front lines, where other active players may attack you. There are a variety of operations available based on army composition and such. Legends does have a few army composition rules to keep things fair, and you can find numerous links to them in the interface itself. Legends is very friendly to new and casual players. You can get a large amount of forces, and if you lose some, they are easily replaced. Legends had really great service and helped with alacrity as I had questions and guided me along the path. Now it’s time to head back and see what sort of damage the St. Ives Armored Cavalry can do! This entry was posted in Video Games and tagged MegaMek, Video Games on 2013/06/10 by Abe Sargent.